How are the seeds of creative energy sown? Where does creativity come from? I think it is our essential life force, energy or spirit flowing through us that we somehow direct. Creativity comes in countless forms. When I look around, every human-made thing I see began as someone’s creative idea. The same goes for human actions and performances. While studying energy and the body, I learned about chakras, a concept from Easter religions. Chakras describe the energy channels of our non-physical body. Our life force moves through these channels. In Western thought, seven colors represent the seven primary chakras. I generally think of the chakras associated with these colors and areas of the body. Magenta is the color of the chakra focused in the area of the crown of the head. Its focus is on a state of pure consciousness. Violet is the color focused in the region of the third eye (forehead area). This chakra is focused on intuitive abilities. Blue is the color of the chakra focused in the throat; it concerns communication abilities. Green is the color of the chakra focused in the region of the heart. It concerns strong emotions and the intersection of feminine and masculine energy. Yellow is the color focused in the naval area and focuses internally and on one’s sense of self. Orange is the color of the chakra focused in the sacrum and reproductive organs. It focuses on family relationships. Red is the color focused at the base of spine and pelvic floor. This chakra concerns one’s security and survival in the world. I also love organic vegetable gardening and am fascinated by the mysterious way tiny seeds, given water, nutrients, light, warmth and protection, can sprout and grow into incredible plants with the ability to capture the energy of the sun. We, in turn, must eat the plants to release their energy so we can live. Our survival depends on the energy in green plants. 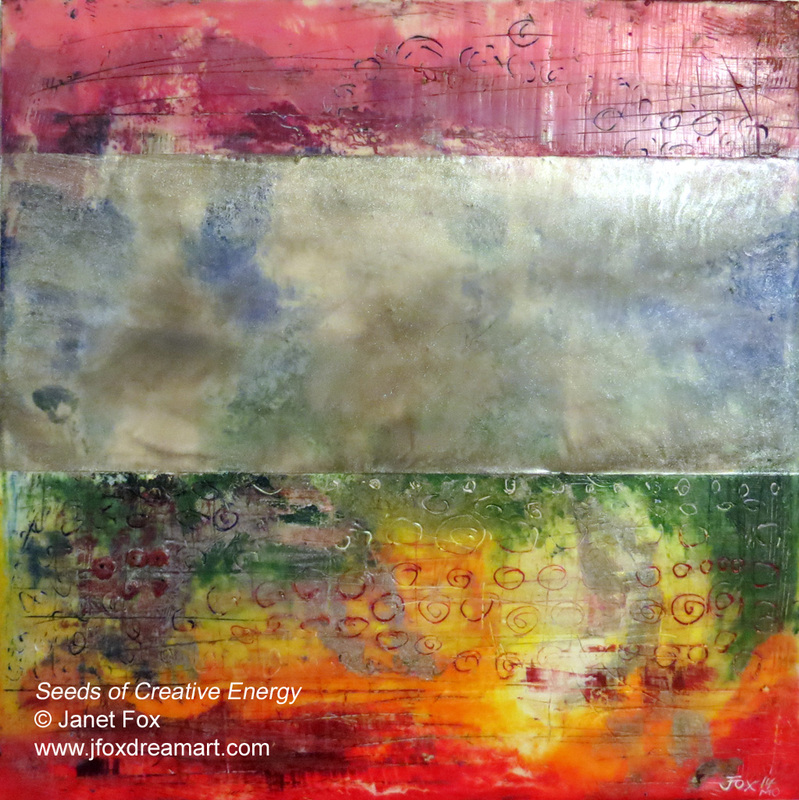 My encaustic painting, “Seeds of Creative Energy,” weaves together these two energy concepts. I began with all seven colors of pigmented wax on a wooden art board. During my creative process, I began to focus on the lower four and the highest chakras and glazed over the blue. I really liked the result, perhaps because I have also been enjoying paging through many colorful seed catalogs and planning my vegetable garden now that warmer weather is here. Draw, color or paint to see what your energy can create.